On the mission to ski the major mountains in the Balkans, the next logical destination was Romania and the Carpathian Mountains. The expectations were not very high, but in the end we realized our perception of Romania was mostly wrong. We expected a poor country, with outdated infrastructure and mediocre mountains. In the end it turned out a great "boys weeks" destination, with superb ski-touring terrain, interesting food, friendly people, lively historical cities in Transylvania and breathtaking medieval castles, which inspired Drakula. We also realized the western Carpathian Mountains are actually closer (6 hours) to Slovenia then most of the mountain ranges in the Balkans (9+ hours), with completely new highways as a bonus. 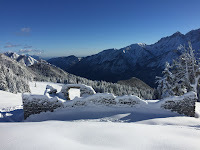 As the opening photo suggests, we had very serious winter conditions throughout the whole week. Snow was abundant and the temperature was -5 C in the valley and down to -20 C in the mountains. 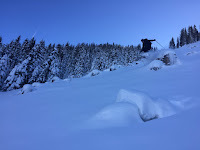 Despite having only one sunny day, all ski-touring trips were a big success. After having delicious Hungarian goulash at my good friend Jerry in Kecskemet and spending a charming evening in Timisoara (photo above), we penetrated the western Carpathians and settled in Poiana Marului. This is now a quiet village set between the mountains, but used to be a luxurious tourist destination for Ceausescu and his communist elite. For starters we attacked Bistricioara (cca 2000m) over the ridge and surprised a few loggers when skiing back to the village. We spent the night in the cozy Artarul pension, which is run by a retired Canadian "Gasterbiter" and his lovely wife. The next morning we did a quick tour of the ruined 5-star hotel (photo below) and continued our journey towards the east. In conclusion, the ski touring season 2017/18 was very productive and lasted for more than six months. This was something normal between 2006-2012, but less common in the last years. It was very cold with constant percipitation, which is also the reason why we skied lower mountains. Actually the average "summit" hight was only around 1750m. Karavanke and Pokljuka were the winning destinations, and I have skied many of the mountains for the first time (Grajščica, Murnovec, Macesnovec, Brda, Matajurski vrh, Bela peč and Srenjski / Studorski pass). I also had the opportunity to ski with my coworkers Robert and Miha, and most important - my son Jakob! After we completed the memorable Murradweg about six years ago it was (more then) time for a new cycling adventure. Over the years I have learned that pushing our physical limits was usually not yielding dividends; on the contrary, other aspects of the journey were pushed aside and Ana was not happy with me to say the least. For this reason, I decided to make a very easy plan with maximum 50km of cycling per day and a bigger emphasis on local culture, food, swimming, nature and most important - relaxation. 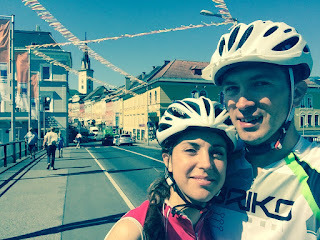 The expression on Ana's face at the end of the trip in Villach (photo above) is proving the plan was accomplished. Before entering Slovenia the Drava (Drau) river flows through south Austria for around 300 kilometers; however, not known to many, it starts its journey as a tiny stream in Italian Dolomites, very close to a town called Toblach (Dobbiaco). After Lojze and Zoja dropped us off and headed home, we started to descend towards the Austrian border and later to Lienz - a lively alpine city. We were very lightly equipped, but had all the basics we needed. We cycled for about 3 hours per day, did a lot of swimming in Drava and the nearby lakes. We also enjoyed the Austrian food, which is not very light but certainly worth the sin. After 4 days of cycling, we took the train from Villach to Ljubljana and concluded we are coming back, next time with the kids! I really cannot help myself but to post a traditional title "with the boys" for our legendary trips in the Balkans. Also note there is a post category called "Boys week" on the right side menu, which will filter out all the historical multi-day adventures with more or less the same boys! This year we decided to go for a Balkan classic - starting in the Rila mountains (Bulgaria) where we finished off exactly two years ago. 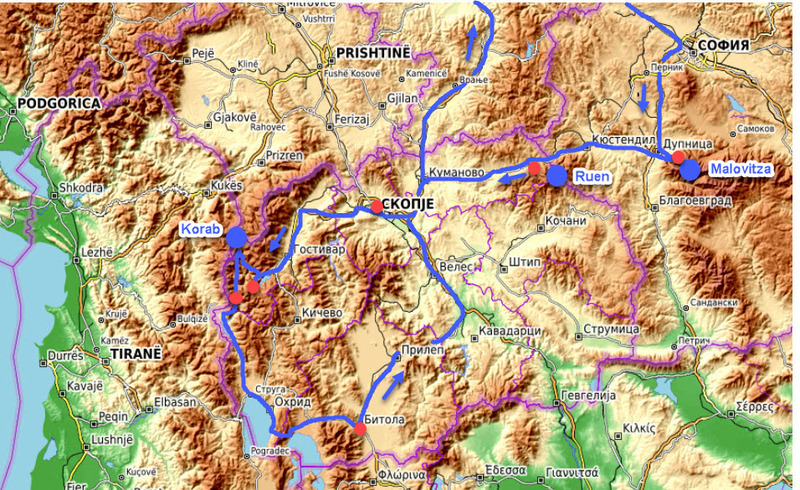 We then continued across the border to Macedonia, a country which is culturally diverse and geographically rugged. 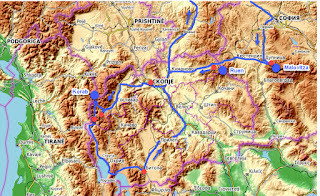 The biggest mountain range stands on the west, stretching from the capital Skopje towards the Ohrid lake on the border with Albania. A big portion of the mountains fall under the Mavrovo national park, while the highest peak is Korab. Not known to many, but this was actually the second highest peak in former Yugoslavia (right after Triglav in Slovenia). In addition, smaller mountain pockets are sporadically distributed across the country. This year we were really not lucky with the weather, but still we managed to squeeze three ski-touring trips and even more important, enjoyed quality time with the boys. The trip map and a few snapshots below. Although the weather was not really cooperating, the trip had other emphasis and we could really absorb the Macedonian culture and most important - free our Balkan soul.